Stavanger Travel is a portal site used by visitors to, and residents of, the region of south west Norway - including Rogaland, Agder, Telemark, and Hordaland. Database registration - establishments can register with our database, so that users can search or browse to find them. The rest of this page will help you decide what solution is best for you, and you can contact us by filling in an application form. At the bottom of the page are some "Freqently Asked Questions" giving examples of how to register. We are a restaurant with a separate bar - which should we register as? You can register as just a restaurant - your bar will be written about, but only seen by people looking for restaurants. If you bar business is important then register both parts of the business. People looking for restaurants or bars in the area will not see them unless you register them separately. We would also recommend that you run adverts across the site, to maximise your exposure to our users. Should I advertise, or register in the database, or both? If you register in the database, then users looking for your type of service or product in your area will find you; if you advertise, you can be seen across the whole site - or just part of the site, with a link to your (database-driven) page, or to your own web site. If I advertise, do I have adverts across the whole site ("run-of-site") or just a part of the site? You can choose either way. Advertising rates vary by "zone" of the site, based on demand. How do I pay for database registration? This is an annual subscription paid in advance. The amount depends on the type of establishment, and any extra optional pages. Advert runs are set up for one or several zones of the site, for a multiple of 1000 page views, at a certain (variable) rate, known as CPM (Cost Per M, or thousand). 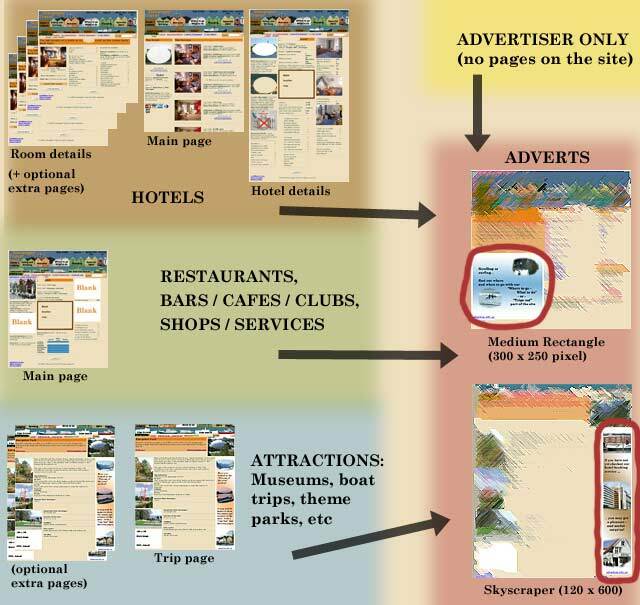 You choose the zones, the advert size, the destination URL (web address) and also the priority of the advert run. All of these can affect the advert rate, which you can see while choosing. You are invoiced for multiples of 1000 viewed adverts, or for views of advert runs that are cancelled, rounded up to the next 1000. The standard hotel pack includes four room types - what does this mean? Each different room type (single, double, suite) and different rate (e.g. rack, weekend), and option (e.g. non-smoking, ladies-only) will be a different room type. Some hotels will want many more than four of these room types, available as an optional extra. You only run two types of advert on the site - why is that? How do I set up adverts to run on the site?? After you have registered with us for advertising you will get access to your own area of the site, allowing you to set up, view and change the status of your adverts. We don't have any advert images - how is this done? Advert images are small (optimised) graphic gif or jpg files. Contact your graphic designer, or SouthernFjord Web Development for help with producing them. We don't have our own web site - what should we do about a (URL) target address for our adverts? You could "point" your advert link to your internal page on this site, if you have one (and you would get a discount advert rate!). You can also contact your web design agency, or SouthernFjord Web Development for help and advice on developing a web solution that is right for you.